having grown up in Vienna, Austria as well as Raleigh, North Carolina, in the United States, offers the consultation in German and English. She studied Medicine at the Universities of Vienna and Graz (2nd and 3rd term with distinction) and participated in all available elective courses in physiological and integrative medicine (acupuncture, manual medicine, balneology, chronotherapy, physical therapy, homeopathy). She specialised ("vertiefte Ausbildung") in genetics, allergology, orthopedics and physiological therapies. After absolving acupuncture exams at the University of Graz (Dr. Dorfer), she deepened her education in the Department of Traditional Chinese Medicine, in the Chinese-Japanese Friendship Hospital in Beijing, China (acupuncture, moxa, cupping, GuaSha, Tuina, QiGong, TaiQi, herbal medicine and TCM theory). She received the Austrian Medical Chamber Diploma for Acupuncture after the exam (with excellence) at the Austrian Society for Acupuncture. After completing courses in Sports Science (University of Vienna), Nutritional Sciences (University of Vienna), European Master in Public Health Nutrition (Karolinska Institutet, Stockholm), Health Economics (Stockholm School of Economics) and Entrepreneurship (Stockholm School of Entrepreneurship), she worked as a business consultant (Senior Associate, McKinsey & Co.) - projects included strategy and process optimization of health insurance providers, a rehabilitation clinic, as well as for energy companies, mobile phone and internet providers. Specialty training for general medicine ensued in Vienna (in gastroenterology, cardiology, oncology, surgery, traumatology, orthopedics, ENT, dermatology, pediatrics, infant psychosomatics, neurology, gynecology, obstetrics), in Weston-Super-Mare (England, Acute Medicine), and Innsbruck (Physical Medicine). Completion of specialist training, exam and award of title Doctor for General Medicine. Further specialty training in Medical Oncology. Additional courses: Emergency Medicine, Manual Medicine (Tilscher), Integrative Medicine (Vienna KAV). Dr. Singer set up and led the acupuncture clinic in the Department of Oncology in the Wilhelminenspital (Head of Department: Professor Ludwig). Specialist physician rotation in orthopedics and orthopedic surgery at the University Clinic Innsbruck and in Munich. Board exam and award of Specialist for Orthopedics and Orthopedic Surgery. Further training including a study trip for Ayurveda to India, Coaching, Sports Medicine. Further consulting projects for hospitals, start-ups, and the founding of an e-health start-up followed, as well as work for large practices and an outpatient rehabilitation center. 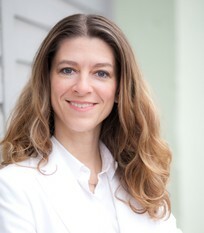 Dr. Singer joined a joint practice first in Fürstenfeldbruck and then in Munich, where she practices a comprehensive and holistic treatment concept.